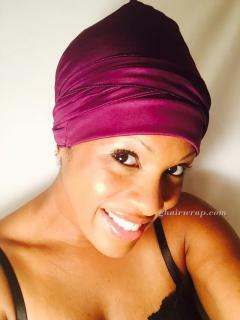 Select Burgundy 12" Burgundy 21" Yellow 12" Yellow 21" Black 12" Black 21"
G-Wrap hair tube protects your hair while you sleep! Our unique signature design-wide headband and drawstrings prevents it falling off during sleep. For a chic daytime turban or headband simply scrunch together and you have a stylish accessory. Comes in two lengths: 12" long for short to medium length hair and 21" for long hair, dreadlocks, twists or braids. Our very soft and stretchy fabrics make them super comfy to wear anytime. No elastic to stretch out! One size fits most. Hand/machine wash, delicate, hang dry. 100% polyester interlock knit.